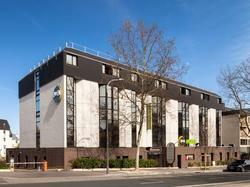 B&B Hotel Paris Chatillon is located within 9 km of central Paris. Chatillon - Montrouge Metro Station is less than 2 km away and provides direct access to the Champs-Elysées. All of the rooms have soundproofing and feature a wardrobe, desk and a flat-screen TV with cable channels. The private bathroom includes a shower. B&B Hotel Paris Chatillon features vending machine with drinks and snacks. The nearest supermarket is a 3 minutes' walk away and restaurants can be found within 400 metres of the property. Free WiFi is available in all rooms and public parking is possible on site. This room features a wardrobe, desk and a flat-screen TV with cable channels. This room features a large double bed, a wardrobe, desk and a flat-screen TV with cable channels.